Timing is everything. When an economy turns, big projects that looked like they were going to be winners suddenly lose big time. 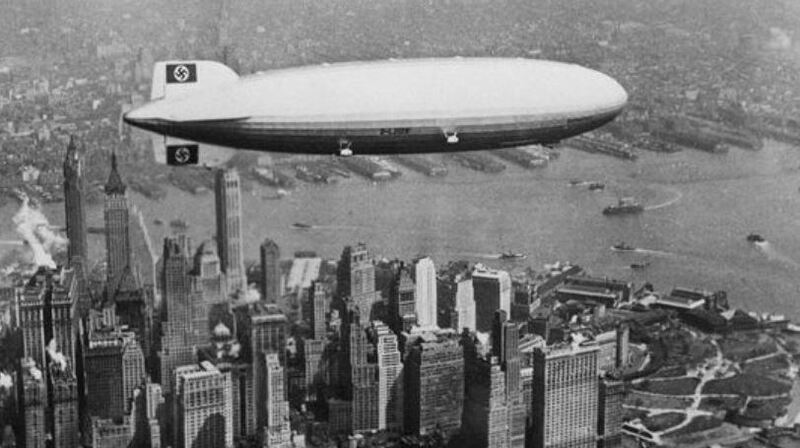 That was the case when a world tour had been planned for the world’s biggest airship, the Graf Zeppelin, in 1930 just months after the 1929 Crash. In May 1930, the Graf Zeppelin floated over the Cape Verde Islands and slowed down stopping at the Porto Praia post office. When the ship had maneuvered to just the right spot, its crew threw a big sack of mail. To fund the voyage, they struck a deal to carry mail around the world which would be the first international air mail. 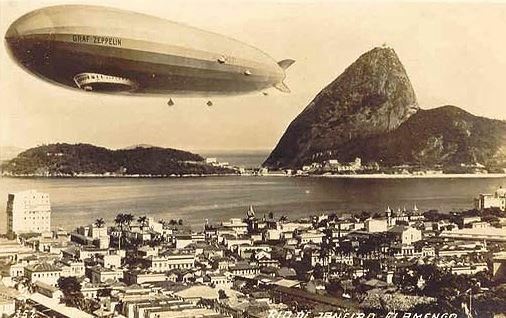 Over the next several weeks, the 775 feet from nose to tail Graf Zeppelin completed its first Pan-American tour stopping in New Jersey, Ohio and flying to Rio de Janeiro and then back over the Atlantic to Spain and its home country, Germany. A lot of publicity and fanfare accompanied the airship’s journey which was funded by carrying sacks of mail. This was the largest flying machine the world had ever seen. Its operating costs were proportionate, clocking at about $4 per mile back then which was a lot of money. Passengers paid very high ticket prices, but the ship could only hold about 20 people at a time. Passenger travel was not a lucrative venture. The Hindenburg ticket prices across the Atlantic was the price of a car about US$400.00 one-way and a round trip was US$720.00. They also tried to charge admission fees to view it on the ground. That did not prove to be a winner either. The timing was very bad for the Great Depression was just getting started. 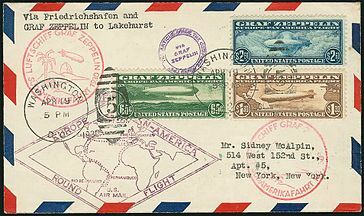 Instead, the Graf’s parent company, German Zeppelin Airship Works, decided to recoup costs by commissioning special stamps from the countries on the tour route. Only letters with these stamps on them would be accepted onto the airship, or so they announced. They promised to deliver these letters to their destinations around the world. This was the only commercial transatlantic airmail option available at the time and was days faster than sending a letter by boat. Brazil, Bolivia, Germany, and Spain all made the Zeppelin stamps, and 93% of the proceeds from each stamp was funneled back into German Zeppelin Airship Works. Finally, after considerable debate, the U.S. Post Office decided to get in on the hype. They assumed that stamp collectors would want the stamps and they would never be used so they would pocket a fortune. The agreed to proceed and they went to designing and printing a run of Graf Zeppelin stamps all in a matter of just weeks. They called this a gesture of goodwill toward Germany, which was the Weimar Republic government. The pledged to also contribute 93% of all the revenue collected on stamps “used” on the flight to the Airship Works. They cleverly qualified the agreement expecting American stamp collectors would buy up most of the stamps for collections and that would go to the Post Office. So on April 19, 1930, the Post Office issued three stamps, The 65-cent stamp covered the cost of a postcard one-way. The $1.30 stamp covered the cost of a letter one-way. The final stamp, the $2.60, it covered the cost of a letter being postmark over to Europe and then back again. However, because of the deepening Great Depression, collectors could not afford the $4.55 when a loaf of bread sold for just 9 cents. The Post Office printed 1,000,000 sets of stamps expecting a mad rush. 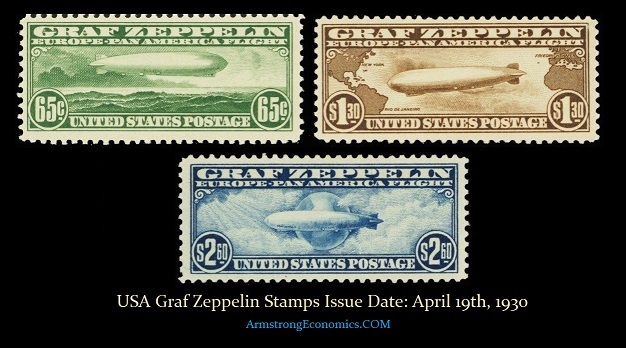 They sold only about 227,000 zeppelin stamps total, and most of that actually did end up on mail delivered by the Graf Zeppelin and the lost an expected big windfall. 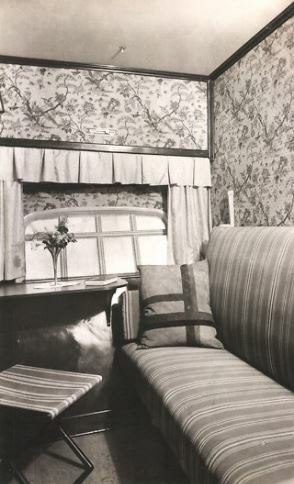 The worsening Great Depression undermined the entire trip of the Graf Zeppelin. It was a fantastic idea and it was a show of power for Germany after the hyperinflation of the ’20s and losing World War I. Timing is everything. A great idea foiled by the business cycle.